On Thursday the 29th of November, IE hosted a conference titled “La dolce vita, or how Federico Fellini killed the modern man”. It was led by the literary critic Fernando Castanedo, and the lecturer divided the conference into three parts. The first part served as an introduction to Rome in the 1960s and the character Fellini. The second part looked at the different chapters of the film and Fernando concluded the conference by analyzing the characters Steiner, who represents modernism, and Marcello, who represents postmodernism. The first part of the conference was full of anecdotes from the golden era of the Cinecitta Studios, when many Hollywood stars lived in Rome. The city was paralyzed by stardom and there is a famous part of the film, led by Anita Ekberg, which parodies the receptions given by the stars. Fernando also spoke about Federico Fellini and his complex personality, describing him as a “liar by birth”, catholic and frequent visitor to clairvoyants. 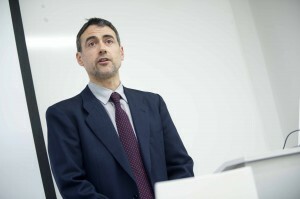 During the second part of the conference, Fernando analyzed the film in great detail. He described the symbolism, tributes, anecdotes and inspirations behind each scene. The film is difficult to explain as it is essentially “a film without plot, that doesn’t care for storytelling, the protagonist is the most important part”. Fernando finished by saying that it was “based on Aristotle´s La dolce vita is an amorata, the moral portray of a person”. Once he had informed the audience on both the artist and his piece of art, Fernando shared his theories about Steiner and Marcello. He sees them as master and follower, Steiner is the super-ego of Marcello. Steiner represents a left wing intellectual and changeless character, while Marcello is apolitical and changeable. The lecturer also used some literary references to compare the main character to “a Dante pilgrim who travels between evils”, ending up with la dolce vita, “which is as an allegory to the style in the Wizard of Oz; good is not always what it looks like”.